Ann specializes in educational evaluations for school-age children in both our Community Clinic and Center. She has a long history of working with children of all ages and special education needs. She really enjoys being able to help kids recognize their strengths and feel good about themselves as learners. 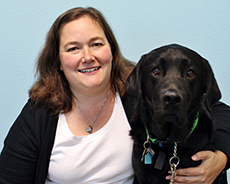 Ann initiated the Animal-Assisted Therapy Program at Children’s Health Council and is now handler/social secretary of our staff therapy dog, Tavish. In her spare time, Ann enjoys reading, being outdoors, having time with family and friends and photography. Tavish has been with Children’s Health Council since November 2012. He specializes in making our kids, parents and staff laugh and feel good. A very calming presence, Tavish works with the children in our clinics and schools as a therapeutic tool to help them talk about feelings, participate in activities and just have “Tavish Time” as a reward. He can often be found lying on his back in the hallways waiting for someone to rub his belly. In his spare time, Tavish enjoys romping with his dog friends, lying in the sun and hoping that Ann will open the peanut butter jar.